CISMA may sound like an alien species, but the acronym refers to an effective approach in combating exotic plants and animals that threaten ecosystems. And it’s an approach taking shape on Georgia’s coast. Representatives of more than 40 organizations met last month to launch the Coastal Georgia Cooperative Invasive Species Management Area. The goal: Conserve the region's native wildlife and habitats through a collaborative effort to prevent or control invasive species on public and private lands in 11 counties. 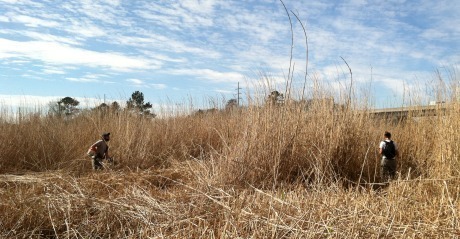 Georgia Department of Natural Resources botanist Eamonn Leonard, who coordinated the meeting, said the cooperative is aimed at focusing efforts and filling gaps in the war on exotic aliens like Chinese tallow tree, the giant reed phragmites (pictured) and feral hogs, species that can reshape landscapes and displace native wildlife. “What are the gaps, what are we doing and how do we work as a cooperative to fill those gaps,” said Leonard. Cooperative invasive species management areas, or CISMAs, are offshoots of cooperative weed management areas started in the western U.S. to cope with invasive plants. The model was adapted in the Midwest, Northeast and the South to accommodate more land parcels, more land owners and often more than plants. Florida’s network grapples with everything from ball pythons to Brazilian pepper-trees. Purdue University’s Kate Howe, coordinator of the Midwest Invasive Plant Network, helped with the March 15 workshop in Richmond Hill. Howe said the key benefit of cooperatives is seeing landscapes as a whole. CISMAs also provide a structure for detecting invasive species early, raising public awareness, training staff and acquiring grants. Challenges include getting organized and staying energized. Leonard, who works with DNR's Nongame Conservation Section, considers the coastal CISMA critical. “Just from the planning meeting … it has really short-circuited a lot of isolated efforts to figure out what is the best method" to control a species, he said. A steering committee will meet in May to chart the group’s future. Partners have already coordinated a water hyacinth pull for later this month (email eamonn.leonard@dnr.state.ga.us to volunteer) and an Invasive Species Workshop at Skidaway Island State Park on June 14 (more at www.gaeppc.org). Read the full announcement about the Coastal Georgia Cooperative Invasive Species Management Area! Report sightings at Early Detection & Distribution Mapping System. Learn more: UGA Center for Invasive Species & Ecosystem Health; the Georgia Invasive Species Strategy (pdf) (which identified 83 invasive or potentially invasive plant species, 111 animal species and 30 disease-causing organisms); Georgia's cogongrass cooperative. Exotic reads: "Fixing the one dumb thing that Benjamin Franklin did," “Plant invaders taking root,” “Kudzu bugs raise concerns"
On a recent cool April morning, I was greeted with a chorus of bird songs from some familiar year-round residents. Then I heard a call I hadn’t heard this year. From the back of my lot came a loud wheep. The great crested flycatcher was back. This robin-sized flycatcher is more often heard than seen. But it is truly a striking bird, with its bright sulphur belly and – best seen through binoculars – rufous tail and wingtips. The great crested flycatcher is also a fascinating cavity-nester. Pairs build bulky nests of typical materials such as twigs, leaves and hair, yet they also weave in bits of rope, plastic and even shed snakeskins! Great crested flycatchers hunt from a perch, eating everything from mosquitoes to beetles, butterflies, moths, katydids, grasshoppers, spiders and even small lizards. The most bazaar item I saw a pair nesting near my office bring back was one of the largest spiders I have ever seen (pictured). Isn’t it amazing what we can see just outside our backdoor? 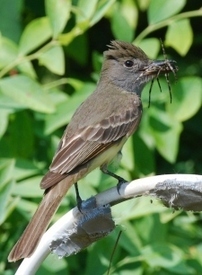 For more amazing insights into great crested flycatchers, check out Terry’s complete column. Terry Johnson is a former Nongame program manager with Wildlife Resources and executive director of TERN, the Nongame Conservation Section’s friends group. Georgia’s state reptile will receive some much needed help from a federal Farm Bill program. But interested landowners have only until April 30 to apply for financial assistance through the new Working Lands for Wildlife partnership. The teamwork pairs the Agricultural Department’s Natural Resources Conservation Service and the U.S. Fish and Wildlife Service in a conservation effort to restore populations of at-risk species and strengthen rural economies. The program in Georgia will involve restoring and protecting gopher tortoises and their habitat in south Georgia, and to a lesser extent – because of limited habitat on private land – the golden-winged warbler in north Georgia. Landowners can apply by month’s end through the NRCS’ Wildlife Habitat Incentive Program. The cost of conservation practices will be shared for qualifying sites. 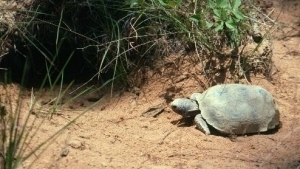 Working Lands for Wildlife will help private landowners in Georgia create, manage and maintain pine savanna habitat for breeding populations of gopher tortoises. The primary practices will be planting longleaf pine, conducting prescribed burns and removing mid-story hardwoods. A State Wildlife Grants project in which the Nongame Conservation Section inventoried Georgia’s sandhills habitat, favored by gopher tortoises, helped identify counties the program will benefit most. Longleaf pine forest, one of the world's most biologically diverse ecosystems, provides critical habitat for gopher tortoises and other imperiled species. The gopher tortoise is a keystone species and indicator of longleaf pine ecosystem health. Gopher tortoises depend on deep, well-drained soils and an open understory. In turn, their burrows provide vital shelter for many at-risk species. Gopher tortoises also help disperse plant seeds. Habitat destruction, degradation and human predation have greatly reduced gopher tortoise populations. 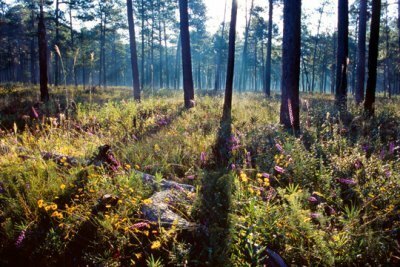 More than 90 million acres of the U.S. Southeast was once covered by longleaf pine savanna. About 3.4 million acres remain today. More than 80 percent of gopher tortoise habitat is in private or corporate ownership. The Altamaha shiner was found on the Yellow River downstream of Porterdale Dam during a fish and mollusk survey led by DNR. The discovery marked a new occurrence in the watershed for this species listed as state threatened and petitioned for federal protection. Bat research at Sapelo and Little St. Simons islands is off to a flying start. Working with University of Georgia student and former DNR intern Craig Bland, current Nongame Conservation Section bat interns Jackie Jeffrey and Bronson Curry recently caught their first northern yellow bat on Little St. Simons. The two-year project is focused on exploring the species' abundance and roosting and foraging preferences. The Georgia Mountain BirdFest returns to Unicoi State Park & Lodge May 4-6. More than 60 field trips, guided hikes and hands-on activities are open to birders of all ages and skills. Registration ends April 23. McDuffie Environmental Education Center has some new and much needed digs. After operating for years out of "retired" mobile classroom trailers, which had rapidly deteriorated, the center opened a new classroom with ADA access, discovery room, restrooms and office space for educators last month at McDuffie Public Fishing Area near Thomson. Changes to Georgia’s conservation tax credits are outlined in this article by Kevin McGorty, director of Tall Timbers Land Conservancy. McGorty highlights how lawmakers in the 2012 General Assembly tightened the Tax Credit Program that has protected more than 116,000 acres since 2007. At least half of two new peregrine pairs in Atlanta are natives. The males of both pairs – one has a confirmed nest near Perimeter Mall – were banded as nestlings at SunTrust Plaza nest earlier this decade. Rayonier donated approximately 7,000 longleaf pines that will be planted in tornado salvage areas at Hard Labor Creek State Park, near Rutledge. 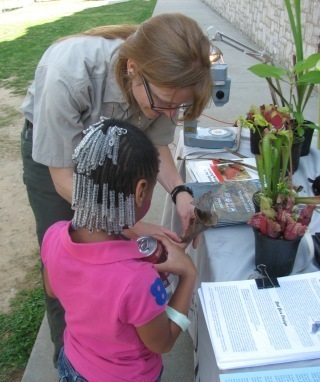 Division efforts to raise awareness about wildlife conservation. Georgia Wild © 2012. Wildlife Resources Division Nongame Conservation Section. All rights reserved.